Steel and aluminium glazing specialist Wrightstyle has secured a contract for the Barnsley, Doncaster and Rotherham Waste Partnership. The £750 million PFI scheme will see the Shanks Group operate a mechanical biological treatment (MBT) and anaerobic digestion (AD) plant at Bolton Road, Manvers, with the facility due to open by 2015. 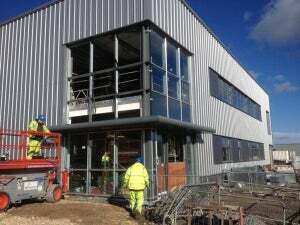 Wrightstyle will supply and install some 280 square metres of heavy-duty steel glazing systems, including curtain walling, doors, screens and windows, complete with high performance thermal glazing. The company was contracted by Border Steelwork Structures, which specialises in the design, fabrication and erection of steel-framed buildings. The contract covers several buildings on the site, including operational and workshop facilities and a visitors’ centre, underlining the role that steel glazing systems can play in the design and build of environmentally-sensitive projects. Barnsley, Doncaster and Rotherham have almost 350,000 households which last year between them produced around 340,000 tonnes of waste, almost one tonne per household, with a key priority being to divert as much waste as possible from landfill. Also this year Wrightstyle significantly extended its system range by becoming a network partner for global building envelope giant Schueco. The Schueco accredited training scheme gives customers the assurance that its fabrication and installation partners have been highly trained and approved to supply the company’s enhanced aluminium glazing systems. All Wrightstyle staff have now been trained and approved by Schueco, allowing the Devizes-based firm to offer a comprehensive range of both steel and aluminium enhanced systems to mitigate against fire, or ballistic and explosive attack. In a further company development, Wrightstyle has also been assessed as compliant with the contractors health and safety scheme (CHAS), and registered on its national database. CHAS, the largest and fastest-growing health and safety assessment scheme in the UK, provides pre-qualification assessments to a nationally recognised and accepted threshold standard, and being CHAS approved reduces duplication as suppliers’ compliance is accepted by all CHAS buyers. Wrightstyle supplies its glazing systems nationally and internationally, reflecting the increasingly specialist nature of the market. The company also offers a full design, supply, fabrication and installation service.